Come share in these special moments of your child's first months, and first year! Nurture your baby's brain, body, heart n soul......And Give the Gift of Music! Sweetness, Warmth, and Sharing the Joy~ sensory play, singing and dancing classes for babies to 18 months with a parent or caretaker. On-Going All Year. Join Anytime! Unlimited Classes in Santa Barbara and Goleta to attend at any studio, any day, afternoon, weekend or night. 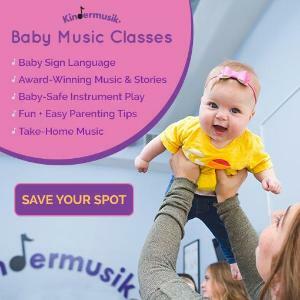 Baby Families can attend any Babies, Family Time, and Music w/ Seniors classes for their Unlimited Subscription value of only $70 a month (2 month minimum) + $30 for At-Home Music w/ instruments, cds and books. Siblings 50% off! Classes are prorated from when you start. Join Anytime! Your first class is FREE! BOOST BABY'S BRAIN AND YOUR BOND! Music is one of your baby's favorite ways to LEARN! AND it's one of the best things for your baby's developing mind. Babies' brains are filled with billions of neurons just waiting to be connected through sensory stimulation. That's what we do when you're in Kindermusik with Kathy & Friends: we offer a sensory rich environment, complete with music, movement, sensory play games and fun, to create and strengthen baby's neural pathways. Each Kindermusik class touches on every learning domain, creates special bonding moments, and begins to instill a lifelong love of music.